To understand the DDC, we need to know a little bit of history about what was the things before the DDC invention and why it was invented? So that we can have a broader view of the primary purpose of DDCs. The Programmable Logic Controller or PLC used to control and monitor the Process mainly in the industry like automobile and other manufacturing factories. Richard Morley invented PLC in 1968 to fulfil the primary needs of control and protect the production capacity of machines and manufacturing lines in the industry, and this PLC used initially was in the area of transfer lines in automotive plants. Due to these PLC or Programmable logic controllers were designed and invented mainly for controlling and monitoring or automating the productions in the industry. But when it comes to buildings, these PLC cannot fulfil the exact needs in terms of tenants comfort, environmentally green or can say effective management system for buildings. And still, we can use PLC for Building automation whereas it will be an excessive investment and different performance. So here DDC or direct digital controller invented in order the process and automated the building equipment needs almost which PLC can do with minimal investment from installation to engineering. 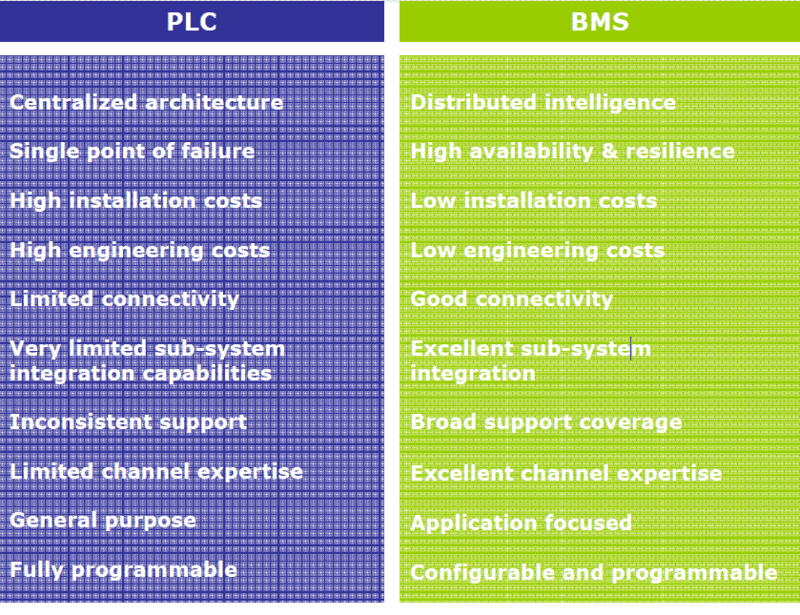 What is the Main Difference between PLC and DDC? What is DDC or Direct Digital Controller? In a nutshell, DDC is a controller which use the analogue or digital signals from various devices of a field sensor and actuators and then process and control the system based on the programme written inside the controllers and has the capability to sends the information to another controller or DDC. The Analogue Inputs is to monitors the fields sensors values. Digital Inputs to monitors the on/off status from switches/contactors. The analogue output is to control the field actuators devices. Digital Output is to control relay or provide low voltages. DDC must have internal ROM/RAM to store control logic and sensor values. It must have networking protocols inbuilt to transfer the data between the devices. Modern DDC controller should have the capability to implement BACnet protocols for communication. Note that there are various DDC controllers available in the market from the different manufacturer and those DDCs are available with a variety of function and features based on the specific needs like controller has all inputs/outputs like Analog inputs, Digital input, analogue output and digital output and some controller has only digital/analogue inputs. 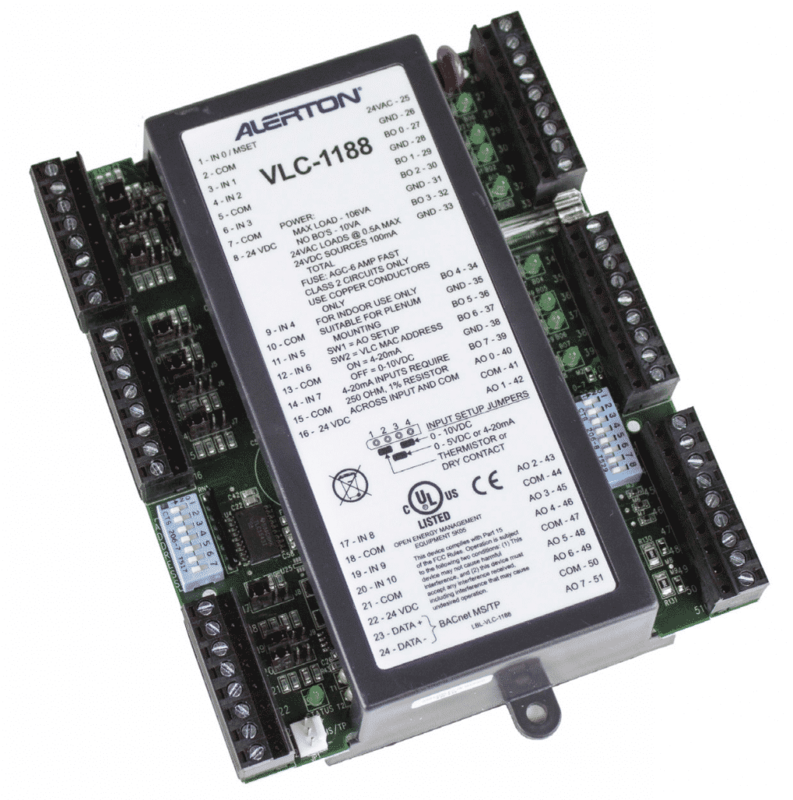 Let us see some DDC Controller from Alerton Honeywell. Eleven 10-bit universal inputs whereas we connect either analogue input or digital input using a jumper select, eight binary outputs, and eight analogue outputs. Terminal 23,24 used to connect other DDC controller to communicate between devices through BACnet over MSTP. It has non-volatile memory used to store program and work independently. It has the 24vdc used to give power for field devices. 2 Booster pumpS, one is for filling the water tank and other is to pump the water to buildings purpose to tenants like toilet etc. Pump-1 should run if the water level below the high level and stops once above the high level. Pump-2 should run if the pressure on the supply line lesser than the defines let us say 2.5bar. Pump-2 Should not run if water lesser than the lower level switch even pressure lesser than defined. Note that this program may change for each vendor controllers.